Students are constantly asked to respond to text. Whether reading literature or nonfiction, students need to know how to write a response to text to demonstrate a deeper understanding of the reading. When students give a short answer response to a text, they often give the shortest answer possible. However, its not completely their fault because this is how students have been trained. They are used to simply answering the question. In order for students to learn to effectively write responses to text, we must teach them how to cite evidence and explain it. Here is an easy formula to teach students how to write an effective response to text. The technique is called ACE. This format helps to move kids past the one-sentence answer to an more in-depth response. CLICK HERE to grab my FREE A.C.E. 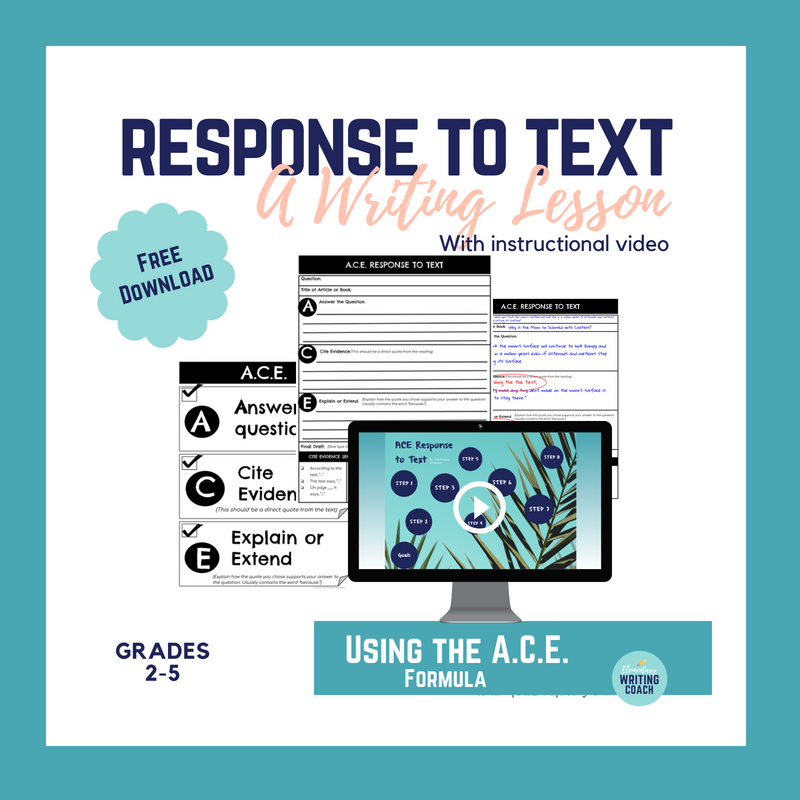 Response to Text Lesson pack! This is the first step with responding to text and usually this is as far as students go. They give an answer, but they don’t support their answer with evidence from the text. Teach students to answer the question using a complete sentence (which usually requires them to restate the question). Explain what you think the moon's surface will look like in a million years if astroids and meteors stopped hitting its surface? Support your answer with evidence from the text. I think the moon’s surface will continue to look bumpy and rough in a million years even if astroids and meteors stop hitting its surface. Usually, this is as far as students take the response. However, now we need to find evidence from the text that supports this answer. This is the second step. Students need to find a quote from the text that supports their answer. I encourage students to write the direct quote and not summarize. The summary comes in the Explain or Extend portion of the response. Now that I have answered the question and provided evidence from the text to support my claim, I need to explain how the quote relates to my answer. Finally, students need to explain how the quote supports their answer. They shouldn’t just summarize the quote or simply restate their answer, they must use a combination of the two. This is the most difficult step for students and usually needs lots of opportunities to practice. I also like to encourage them to use the word “because” in this part of their response to show they are explaining. This shows that craters will remain on the moon forever because previous collisions left permanent marks that will not disappear. Even if astroids and meteors stop hitting the moon’s surface, the moon will never look smooth. I think the moon’s surface will continue to look bumpy and rough in a million years even if astroids and meteors stop hitting its surface. According to the text, “Pretty much any tiny dent made on the moon’s surface is going to stay there.” This shows that craters will remain on the moon forever because previous collisions left permanent marks that will not disappear. Even if astroids and meteors stop hitting the moon’s surface, the moon will never look smooth. With practice, you will help students improve their response to text writing. I have a complete lesson pack to support you with teaching Response to Text in your elementary classroom. CLICK HERE to get the FREE LESSON! Find out more about The Elementary Writing Coach at www.elementarywritingcoach.com.